A fire fighter looks at the smouldering debris inside Ansa Mc Al’s bond at Beterverwagting, East Coast Demerara. 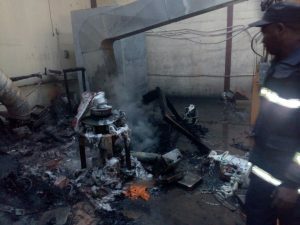 Fire fighters early Monday morning averted what could have been a major fire at the bond of Ansa McAl, located at Beterverwagting, East Coast Demerara. Fire Chief, Marlon Gentle said fire fighters received the call at about 6:40 AM from MMC Security Service and were able to contain the blaze to a section of the bond located in the same yard with the company’s main office. He said it appears as though some geological testing equipment and supplies were destroyed. Gentle said based on the “massive melting” of heavy duty electrical wires that supply current to the equipment, it appears that the fire was of electrical origin. 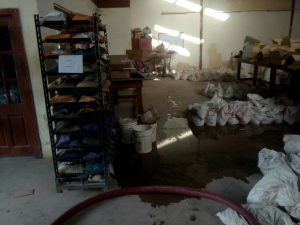 Bags of material in a section of the bond where testing is usually conducted. Meanwhile, fire fighters and residents saved a house at Waller’s Delight from serious damage. A man was reportedly smelting raw gold when the fire started.